THEODORE ROOSEVELT. 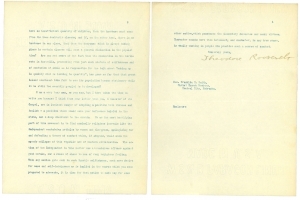 Typed Letter Signed as President, to Rev. Franklin C. Smith, January 24, 1906, Washington, D.C. On White House stationery, with five words added in his hand. 4 pp., 8 x 10½ in. I entirely agree with you that I should be very sure of my ground before giving public utterance to my opinions. As to the subject to which you refer, I am absolutely sure; and as you are a minister of the Gospel I think I ought to say to you that I am so sure of it that I feel that no man who is both intelligent and decent can differ with me. I mean this literally. It is not a debatable subject. I enclose you a copy of my address to the Mother’s Congress. What I have said there is such plain common-sense truth that it is not open to question. Men may differ about the tariff, or about currency, or about expansion; but the man who questions the attitude I take in this matter is, I firmly believe, either lacking in intelligence or else lacking in character. The attitude you seem tentatively inclined to favor is one of astounding folly as well as of astounding immorality. To advocate artificially keeping families small, with its inevitable attendants of pre-natal infanticide, of abortion, with its pandering to self-indulgence, its shirking of duties, and its enervation of character, is quite as immoral as to advocate theft or prostitution, and is even more hurtful in its folly, from the standpoint of the ultimate welfare of the race and the nation. You say that certain French thinkers assert ‘that a limited number of offspring, well cared for and equipped physically and mentally, is a higher service to the state and race than a larger number, necessarily not so well equipped.’ This sentence is rendered pure nonsense by the word ‘necessarily.’ There is no necessity about it. The average child from a fair-sized family is, in my experience, much better equipped to do good service than the average child from a family of only one or two children where the cold self-indulgence, the selfishness, the folly or wickedness of the parents are responsible for the fact that there are but one or two children. Surely you can not but be aware that the result [added by hand: in practice] of the theory of the ‘eminent French thinkers’ to whom you refer is that in France the growth of the population has stopped instead of increasing, and indeed, apart from emigration, is now diminishing, and that frightful [added by hand: moral and physical] evils have followed in its train. In New England at the present time the old native stock is diminishing – that is, there are actually fewer people of the Revolutionary stock left in New England today than there were fifty years ago – and this even eliminating all the emigration from New England. It is as arrant nonsense to speak of its being possible to render service to the state by a course of conduct which means that there won’t be any state to render service to, as it would be to speak of a man rendering service to himself by taking poison. You say that your ministry lies among well-to-do people; that is, among people of means and upper class workers. I assume that you regard these people as desirable elements in the state. Can you not see that if they have an insufficient quantity of children, then the increase must come from the less desirable classes; and if, on the other hand, there is no increase in any class, that then the decrease which is always taking place in certain classes will mean a general diminution in the population? Are you not aware of the fact that the diminution in the birthrate in Australia, proceeding from just such mixture of selfishness and confusion of ideas as is responsible for the talk about ‘making up in quality what is lacking in quantity,’ has gone so far that the great island continent bids fair to see its population become stationary while it is still too scantily peopled to be developed? I am a very busy man, as you say, but I have taken the time to write you because I think from your letter that you, a minister of the Gospel, are in imminent danger of adopting a position both vicious and foolish – a position which would make your influence baleful to the state, and a deep discredit to the church. To me the most horrifying part of this movement is to find nominally religious journals like the Independent containing articles by women and clergymen, apologizing for and defending a theory of conduct which, if adopted, would mean the speedy collapse of this republic and of western civilization. The action of the Independent in this matter was a scandalous offense against good morals, and a cause of shame to men of real religious feeling. When any nation gets sunk in such ignoble selfishness, such mere desire for ease and self-indulgence as is implied in the course which you seem prepared to advocate, it is time for that nation to make way for some other nation, which possesses the elementary decencies and manly virtues. Character counts more than intellect; and character, in any true sense, is wholly wanting in people who practice such a course of conduct. In an article published five years later, Roosevelt publicly denounced birth control as “worse, more debasing, more destructive, than ordinary vice” and recommended a family of four children for the “average man and woman” (“Race Decadence,” The Outlook, April 8, 1911, 763-69). Franklin C. Smith (1874-1950) was born in Maine and married Mary Major in 1895 in Missouri. They had four children between 1896 and 1910. From 1898 to 1900, Smith attended the Kansas Theological School in Topeka, Kansas, and was ordained a minister in the Protestant Episcopal Church. He served as rector of churches in Oklahoma, Nebraska, Idaho, Wyoming, Pennsylvania, and Michigan. During his career, he also wrote several diocesan histories of the Episcopal Church in various areas.